The What: PixelFLEX has launched the weather-rated FLEXStorm LED video technology. Designed specifically to overcome the challenges associated with traditional outdoor LED video displays, FLEXStorm utilizes an intelligent, auto-correcting light sensor control system to ensure optimal brightness at all hours of the day. The What Else: With its adjustable sensors that communicate directly with the cabinets control system, FLEXStorm has variable brightness offerings between 6500-7500 nits. Additionally, using cloud-based content management, updating the FLEXStorm can be done with the click of a button, and the fully front-serviceable panels allow for quick access to the electronics and data control for any onsite service. 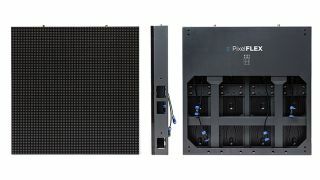 Available in multiple cabinet sizes to best fit unique outdoor LED displays, FLEXStorm data and power connections are 100-percent watertight, creating stable and reliable connections between each cabinet. The Bottom Line: Built to withstand adverse weather conditions while still providing a high-quality experience, FLEXStorm can be utilized for outdoor advertising, entertainment, and much more.